In the mid-1950’s, the House Un-American Activities Committee began investigating the communist influence in the entertainment industry. This searing docudrama from actual transcripts of the hearings reveals how decent people were persuaded to “name names,” and the steep price paid by those who refused. 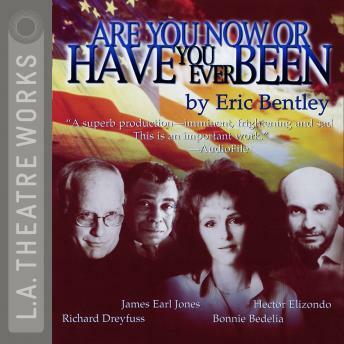 An L.A. Theatre Works full cast performance featuring: René Auberjonois, Edward Asner, Bonnie Bedelia, Jack Coleman, Bud Cort, Richard Dreyfuss, Hector Elizondo, Robert Foxworth, Harry Hamlin, James Earl Jones, Richard Masur, Franklyn Seales, Joe Spano, James Whitmore, Michael York, and Harris Yulin.